The development of analytical models to analyze the behavior of vehicular ad hoc networks (VANETs) is a challenging aim. Adaptive methods are suitable for many algorithms (e.g., choice of forwarding paths, dynamic resource allocation, channel control congestion) and services (e.g., provision of multimedia services, message dissemination). These adaptive algorithms help the network to maintain a desired performance level. However, this is a difficult goal to achieve, especially in VANETs due to fast position changes of the VANET nodes. Adaptive decisions should be taken according to the current conditions of the VANET. Therefore, evaluation of transient measures is required for the characterization of VANETs. In the literature, different works address the characterization and measurement of the idle (or busy) time to be used in different proposals to attain a more efficient usage of wireless network. This paper focuses on the idle time of the link between two VANET nodes, which we denote as Tidle. Specifically, we have developed an analytical model based on a straightforward Markov reward chain to obtain transient measurements of Tidle. Numerical results from the analytical model fit well with simulation results. Martin, I.V., Urquiza, L., Aguilar Igartua, M., Guérin-Lassous, I. 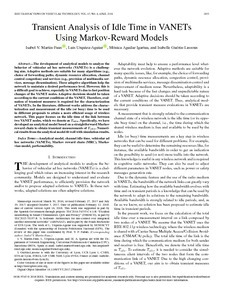 Transient analysis of idle time in VANETs using Markov-reward models. "IEEE transactions on vehicular technology", 10 Febrer 2018, vol. 67, núm. 4, p. 2833-2847.